Last Monday morning, I sat down to work on my blog post for the day and edit some pictures for the etsy shop, but when I pulled up my etsy account, I got a little side tracked by the wonderful sales my online fibery friends had going. and couldn’t quite resist. This mohair comes from MacGregor Hollow Farm. I plan on returning to perhaps purchase some undyed locks in the future. A little more definition in this photo. I love how brilliant the color is, and I have some purple firestar that would complement it very nicely. Next, I have been thinking about what kind of sheep I would like to raise on the Future Fantasy Farm. I have been reading a little about Romeldales and California Variegated Mutant. I like that they are a rare breed. They are supposed to have really nice fleeces, and the CVMs have those adorable little badger faces. To find out for myself, I went looking for a little bit of fleece to test out. (Still thinking about purchasing a whole fleece in the spring) I found someone, namely Stella’s Fiber Farm on etsy who was selling only an ounce of CVM fleece. A great big pile of fluff. The fiber is finer than I expected it to be. For some reason, even though I had read in both The Knitter’s Book of Wool and The Fleece and Fiber Sourcebook that CVM was a fine fiber, I still expected it to be closer to a medium wool. I was dead wrong. This fiber is fine fine fine. When I was at shepherding camp, I picked a merino fleece (as in prepping the fiber) and I swear this is finer. Of course, I know nothing about the sheep this fiber came from. The staple isn’t very long, and it doesn’t seem to me, to be in the greatest condition, but I am going to card it and play with today anyway. Speaking of shepherding camp, when I was at Juniper Moon Farm last month, this one gigantic braid of roving kept catching my eye. It’s dyed in bright amazon rain forest Macaw type colors and did I mention it’s gigantic? It’s so big I had to wrap it around itself to get a good picture–mostly of the colors–I admit. As soon as I read about the Juniper Moon Cyber Monday sale, I went over and snapped this baby up. 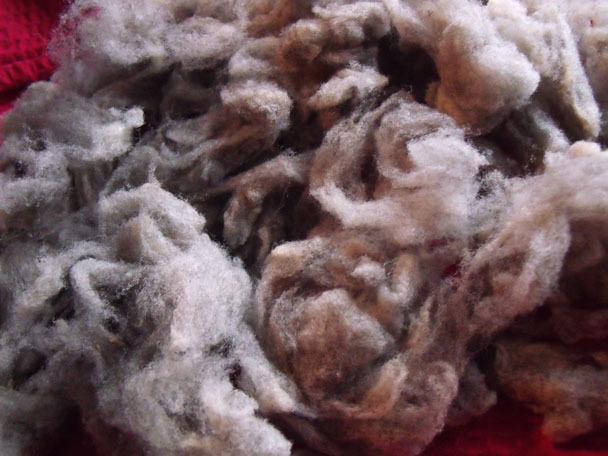 It is nearly 8 oz of the strongest, crunchiest medium grade wool I have handled in a while. I keep thinking of navajo-plying it and knitting a big cabled gansey to wear outside in the cold to help out on the farm. Now, I know it’s not enough to make a gansey for me, but if it could only be part of a gansey, the technicolor parrot dye job would still just make my day every day. I made my way back to etsy with the notion of supporting one my local sellers. 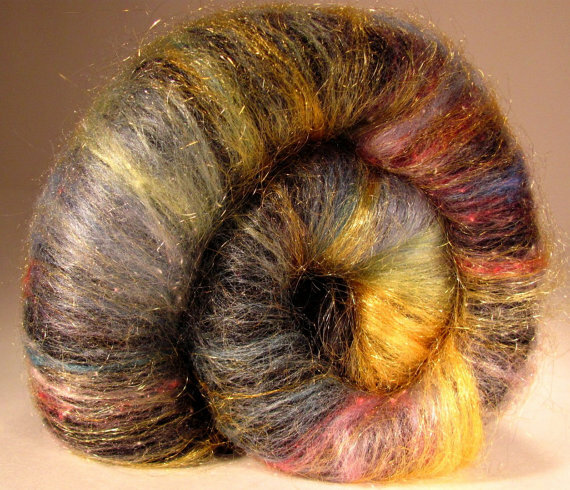 I headed over to Lori Warren’s shop Blushing Ewe and purchased a gorgeous Merino/Silk batt. 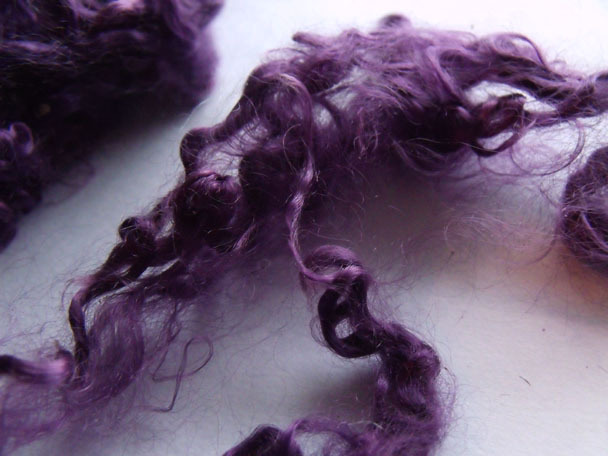 Lori does a beautiful job of combining texture and color in her spinning fibers. She is also very helpful when a newbie spinner like me starts asking questions about technique and blending. (She even let me come pick this up form her house instead of shipping it–since we live about three miles apart–and I got to see her Cricket loom. Now I must have one myself.) Plus, I unfurled the batt after it sat on my desk for a couple days thinking I just wanted to admire the layers of merino, silk, and firestar. Before I knew it, I had pulled it out into a great big ball of roving and was spinning it up. I love the contrasting textures available in hand blended fibers over tops where everything is combed together. For instance, I bought this gorgeous merino/silk top which I dyed up and put in the shop. 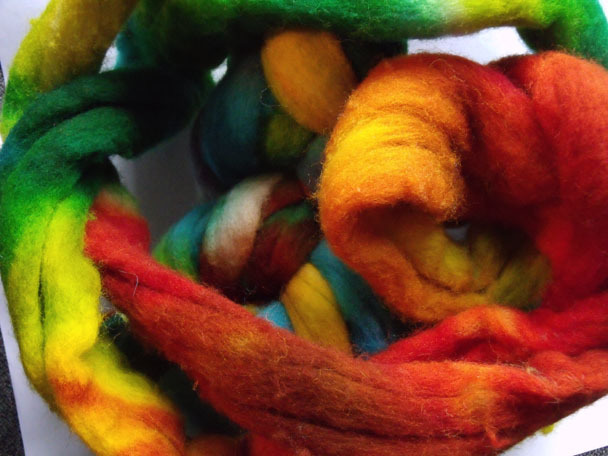 I am in the midst of spinning up a little bit to bolster the handspun section over at Tiny Dino Studios, and it’s just kind of, eh. I mean, it’s gorgeous fiber. 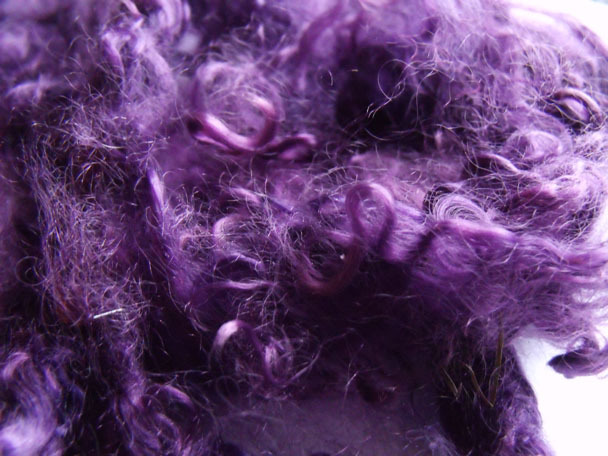 It’s soft and fluffy and has an amazing hand, and I know there are some folks out there who just swoon over the ability to spin those two fibers together in a well-combed top. I am not one of them. I am much more excited about the crunchy medium wool stuff. Give me texture over softeness any day–and I realize this is not necessarily a very popular position, so somebody please take this merino and silk top off my hands! Finally, my self-indulgent splurge was another skein of sock yarn for myself. A Christmas present of sorts. I am calling it my sparkle yarn. 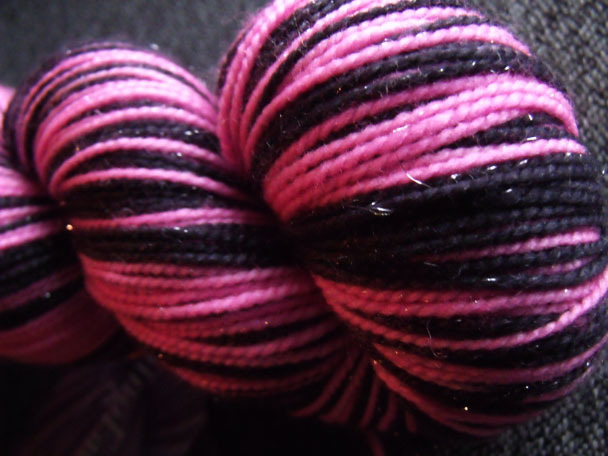 Hot pink and black, self striping sock yarn with little flecks of sparkle here and there. It’s like Laurel from Spinning Fates was reading my mind when she dyed this yarn. I applaud her clairvoyance. And I can’t wait for January and the chance to cast-on.